Does one euro spent at the EU level bring more benefits than if it’s spent at the national or regional level? This is a question that will dominate in the coming months as policymakers try once more to make the case to increase the EU’s own resources and redraft the funding map to boost sustainable growth and jobs. EU leaders for years have tried to put a stop to the sovereign debt crisis that has been tearing apart Europe. They have tightened belts and imposed austerity measures that have cut oxygen to the economic recovery. More recently, they recalibrated, adjusting their rigid strategy to revive growth and boost jobs. At the same time, the EU has managed to adopt a reduced budget for 2014-2020, set at €960 billion. The agreement on the overall legislative framework allows some flexibility and negotiations will continue to clarify the distribution of funds within each policy. Meanwhile, there is a clear sense that more work needs to be done on the question of the EU’s self-generated revenue, or own resources. A high-level advisory group appointed by the European Commission, Parliament and Council will undertake a general review of the own-resources system and deliver proposals in time for the adoption of the next budget period starting in 2020. The added value of the EU budget will feature high in the discussions. Some think tanks have already devised methodologies that would help understand whether one euro spent at the EU level brings more benefits than if it spent at the national or regional level. The Parliament has also asked for increased scrutiny of spending programmes, well aware that the crisis afflicting the EU today goes beyond the economy, and spreads to a deep legitimacy crisis in which financial accountability plays a prominent role. Compared to the United States, the EU does much less to assess its legislative performance. The European Court of Auditors (ECA), the independent EU audit institution, has for years focused much more on the financial and compliance audits, rather than performance reviews that examine the efficiency and effectiveness of the different EU programmes. Together with better spending, significant savings could also be achieved if the 28 member states were to increase harmonisation in some areas, argue some analysts. A recent study by the Bertelsmann Foundation found that EU countries could save between €420 million and €1.3 billion annually (between 6% and 19% of total annual spending in all countries combined) if they reduced the number of diplomatic missions and pooled their consular services. Additional savings could result through harmonised defence cooperation, which will be discussed by EU leaders at their December summit. “A more intelligent response to the austerity challenge is to look at what we spent in aggregate terms - that is, at both national and EU level - and to explore whether we can have efficiency gains by re-organising spending tasks or better coordinating national and EU spending,” said Eulalia Rubio, a research fellow at Notre Europe, a think tank founded by Jacques Delors. 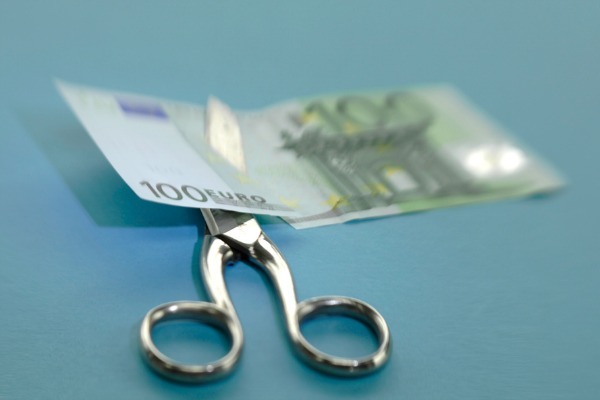 Better spending: €1 = €10? The EU budget was around €140 billion in 2011, which pales in comparison to the sum of national budgets that year - more than €6.3 trillion, or nearly 50 times bigger than the EU budget. To put this in perspective, the average EU citizen paid only 67 cents on average per day to finance the annual budget in 2010. This is less than half the price for a cup of coffee – hardly a large expense given the huge benefits that the EU brings citizens, argues the Commission. The EU budget is smaller than that of the budget of medium-sized member states like Austria or Belgium. The battle to approve the EU’s 2014-2020 budget showed a clear urgency not only to cut spending, but also to cooperate more, so that one euro spent does bring added value. During the negotiations for the 2014-2020 budget, Germany tabled a blueprint for “better spending”, which raised eyebrows amongst many countries’ representatives, who formed the friends of cohesion. At the time, European Commission President José Manuel Barroso said that the conditions under ‘better spending’ would help the implementation of investment under the cohesion policy. “That is why I want to make an appeal. The appeal is the following: that the friends of cohesion and the friends of better spending join what I could call the friends of growth. I am a friend of growth,” Barroso said last year. The European Court of Auditors (ECA), the institution entrusted to recommend changes to funded programmes when these do not deliver intended results, has increased the number of performance audits. The number of special ‘performance reports’ rose from 12 in 2008 to 25 in 2012. According to the Commission’s statistics, 63% of the nearly 500 recommendations issued by the ECA between 2009 and 2012 had been implemented by the end of 2012. More than half of the recommendations issued by the ECA in 2011 have already been implemented. In July 2013, for example, the ECA urged the Commission to end Marco Polo programmes aimed at shifting freight off the roads and onto rail, inland waterways and oceangoing vessels. “To put it simply, the programmes were ineffective as they did not meet the targets, little impact was achieved in shifting freight off the roads and there were no data to assess the achievement of the policy objectives (e.g. environmental benefits)," said Ville Itälä, the ECA member responsible for the report. Not only the environmental impact of the programmes could not be assessed, but also the rules discouraged operators from taking advantage of the scheme. Overall the Marco Polo programme budget for 2007-2013 was €450 million. Another case highlighted by the auditors, referred to the construction and renovation of roads financed by the European Regional Development and Cohesion funds from 2000 to 2013. The EU allocated around €65 billion for road projects. Some of the audited projects in Germany, Greece, Poland and Spain showed cost discrepancies that could not explained just by labour costs. Insufficient attention was paid to ensuring cost-effectiveness in the type of road chosen to be built. “Motorways were preferred where express roads could have solved the traffic problems,” said Harald Wögerbauer, the lead ECA member. “Bigger is not always better,” he said, adding that motorways should only be financed with EU money where there is a verifiable traffic need. The European Parliament, which gained new budgetary power under the Lisbon Treaty of 2009, has stressed the need for better coordination and scrutiny of EU-funded programmes. Citing the differences between the EU and United States, where the US Congress has the muscle to hold the US executive to account, European Parliament Secretary General Klaus Welle said Brussels must upgrade its work on legislative performance. “The European Court of Auditors must go to member states and check whether legislation and spending programmes are working on the ground,” he said. “We need a closer cooperation with the Court of Auditors,” said Welle, adding that the equivalent US government accountability office puts two-thirds of its resources on legislative performance and one-third on the legality of payments. The ECA “is slowly shifting from the focus on the legality of payment to what they call performance audit. It is up to the Parliament to make better use of those audits and make them available before legislation and spending programme are reviewed,” he said. Member states’ national parliaments and local authorities also have a role in ensuring the effective use of EU money, for example, by scrutinising projects on the ground. The British Lords recently blasted the Commission over water aid to Africa. In a letter to Development Commissioner Andris Piebalgs, Lord Timothy Boswell, chairman of the EU select committee, accused the Commission of "culpable waste" in its water and sanitation projects in sub-Saharan Africa. Drawing on a report from the ECA that found serious flaws in the delivery of EU aid to this sector, where fewer than half of projects met beneficiaries' needs and most of the projects were not sustainable in the medium or long term, he slammed the lack of demonstrated value for money, the British daily Guardian reported. Local authorities are also starting to scrutinise projects. At the request of the Lithuanian presidency of the EU, the Committee of the Regions is drafting recommendations on how to better spend money. “For local and regional authorities it is a key topic because it affects their ability to set up and finance projects related to the Europe 2020 goals,” said Alberto Nuñez Feijóo, the rapporteur of the Committee of the Regions. The committee is due to explore measures including the reduction of administrative burdens, as well as the creation of incentives for growth via co-financing or financial instruments, such as project bonds. With EU institutions looking at efficiency in the EU budget, some think tanks have started putting numbers on the added value of EU funding. Some common EU policies have paid off, according to a recent study by the Bertelsmann Foundation. The foundation’s study analysis shows that that the transfer of policies to the EU level and their funding through the EU actually saved national governments money. The study shows that the highly contentious Common Agricultural Policy, or CAP, has allowed savings and even prevented a subsidy race between member states, reducing the risk of political and economic distortion. In 2010 alone, a re-nationalised agricultural policy would have cost member states around €23 billion more than it does currently through the EU budget, which is roughly €50 billion per year. The CAP saves money, said Stefani Weiss, a project manager at the Bertelsmann Foundation. Defenders of the CAP argue that the common policy also generates a range of public goods that national policies could not generate, while critics can point to a variety of public inefficiencies, reads the study. Increasing efficiency also means pooling defence resources. Member states have been debating joint defence action for years. A Common Security and Defence Policy (CSDP) was launched in the 1990s, but there is still no European expenditure or European defence budget. The crisis in public spending induced cuts in defence budgets. From 2001 to 2010, defence spending in EU states declined from €251 billion to €194 billion. These budget cuts also affect defence suppliers and contractors as well as research and development. Between 2005 and 2010, there was a 14% decrease in European R&D budgets, to €9 billion. The United States alone spends seven times more on defence R&D than all the EU member states. Moreover, emerging actors in the global defence market, such as the BRICs (Brazil, Russia, India and China), already today invest more in defence R&D than Britain, France and Germany together. The challenges created by shrinking defence budgets are aggravated by the fragmentation which leads to unnecessary duplication of capabilities, organisations and expenditures. Cooperation and EU-wide competition still remain the exception, with more than 75% of investment in defence equipment being spent nationally. The EU has 16 types of naval frigates versus only one in the US. As a result, the industry lacks necessary economies of scale and risks losing critical expertise and autonomy in key capability areas. “To be more efficient, cooperation between member states and between security defence is critical,” said Barroso. The Bertelsmann Foundation study on the added value of EU spending showed that by integrating European land forces, EU countries would be able to save between €3 billion and €9 billion a year and have in future a total of 600,000 land force soldiers, compared to 890,000 today. “In federal states like the US, Canada, Switzerland and Germany, this sole responsibility for the armed forces is more than accidental historical heritage: there is the convincing efficiency argument that the sub-national provision of defence would be needlessly expensive to the detriment of a high quality service,” the Bertelsmann report authors said. Daniel Keohane, head of Strategic Affairs at FRIDE, a Madrid-based global policy think tank, said the European “pooling and sharing” debate has sometimes focused too much on equipment goals and not enough on production alongside procurement. “There is tremendous waste in European defence spending,” he said, explaining that there are 13 producers of aircraft, 10 of missiles, nine of military vehicles and eight of ships. By contrast, the US – with double the market size – has 12 producers of aircraft, five of missiles, eight of military vehicles and four of ships. The result of the EU fragmentation is a duplication of development and production and different standards of equipment. This fragmentation also hinders the development of common logistical support systems and diminishes military interoperability, Keohane said. An earlier study by Ecorys, a European research and consultancy firm, also found that a substantial EU role could be foreseen in defence intervention and foreign military aid. Fragmentation and waste are also evident in the running of 28-member states’ consular services. Despite the growing role of the European External Action Service (EEAS), foreign affairs has for long been a textbook case for federal authority. “There is a significant European added value which could be achieved in the area of diplomatic missions,” said Weiss of the Bertelsmann Foundation. The foundation has found that EU countries could save from €420 million to €1.3 billion per year if they put together their consular services. In the longer term, there is a strong economic rationale for assigning EU delegations with consular assistance tasks, argues Kristi Raik, a researcher at the Finnish Institute of International Affairs, but the issue has been highly contested. Some member states are reticent to further empower the EEAS and strengthen European citizenship, as they see the ability to assist citizens abroad as a symbol of statehood and national sovereignty. Wishing to go beyond crisis coordination, the European Parliament sees the EU's ability to provide consular assistance as a way to enhance the meaning of EU citizenship and bring the EEAS closer to the public. Several mid-sized and smaller member states are also keen to transfer some consular tasks to the EEAS, precisely to ease the burden of national foreign services and reduce costs. The Netherlands has been most vocal in insisting that citizens expect value for the money that they are spending on the EEAS, and hence the service should take on some consular tasks. The United Kingdom has been the leading opponent of any transfer of powers to the EEAS, be it consular or other matters. Member states are already engaged in extensive practices of cooperation and burden-sharing in consular matters, especially on visa issues amongst the Schengen countries, and common visa application centres are in operation, for instance in the Democratic Republic of Congo and in Moldova. “As EU countries look for new cost-effective solutions, the EEAS is one possibility among many, along with enhanced cooperation with partner countries, the use of new communication technologies, and outsourcing certain services such as visa issuance to private companies,” said Raik of the Finnish Institute of International Affairs. Other areas where experts see strong indications that the money spent at the EU level would reap efficiency gains are: border control, internal security, environmental policies, climate protection and energy policy, research and development, transnational infrastructure, macroeconomic stability, as well as market regulations and guarantees of fundamental economic freedoms, trade and competition policies. “The reasoning behind the added-value concept is grounded in fiscal federalism theories. The assumption is that financial resources that are spent on the EU level in total deliver higher benefits compared to the same amount of resources spent on national or regional level,” Aart De Geus, Bertelsmann Foundation chairman and chief executive, told EURACTIV. EU spending could serve as "carrot" in a carrot-and-stick-strategy to push structural reforms in the member states, De Geus said. To foster the build-up of a functioning public administration, for example, cohesion funds should reward successful national reforms, especially in the euro-area crisis countries. Last but not least, efficiency gains would strengthen Europe’s position at home and in the world, said De Geus, stressing the EU would have more money available to deal with globalisation challenges. “Not least, better spending would enable us to secure our social market model, which is truly a European invention which makes us distinct and which we should keep under any circumstances,” he said. “Europe will only be able to play a distinctive role in global affairs it if it becomes more united and makes better use of its resources,” De Geus said. Speaking after the compromise reached on the EU budget 2014-2020, European Parliament budget negotiator Alain Lamassoure (France) said that the deal was not "sustainably good" for Europe. “If nothing new happens in the next seven years, the budget is expected to decrease, which would prevent achieving the EU to achieve its long-term strategy to return to competitiveness by 2020, or finance the new competences given to the Union by the Lisbon Treaty, and that we have not started funding since 2009, ie three years upon entry into force of the Treaty . This is an aspect on which I insist upon, because we tend to forget,” Lamassoure said. The Conservative MEPs' spokesman on budgetary issues Philip Bradbourn reacted on a report of the Court of Auditors on an EU project to support private forests, calling to take an axe to fribolous and unfocused" spending programmes. The report, released on 19 September, showed that "no tangible results" were achieved by the € 535 million programme. "This report lays bare the abandon with which the EU Commission hurl huge sums of taxpayers' money at pet projects without ever properly considering what benefit will come in return," Bradbourn said. "This kind of frivolous and unfocused spending has to stop." 8 Feb. 2013: EU leaders reached agreement on a €960 billion budget for 2014-2020, representing the first net reduction to the EU budget in history. 27 June 2013: European Commission, Council and European Parliament top officials announce EU budget 2014-2020 final compromise. 4 July 2013: European Parliament approved the budget deal. 24 July 2013: European Commission presents a communication on a comprehensive strategy to strengthen Europe's defence sector. 26 Sept. 2013: EU defence ministers meeting to debate Commission communication on defence industries. Autumn 2013: Final legally binding vote in Parliament on EU budget. Autumn 2013: Committee of the Regions to release opinion on how to better spend the EU’ budget for 2014-2020. 19 Nov. 2013: Defence ministers meeting. 19-20 Dec. 2013: EU summit to discuss Commission communication on defence sector. Bertelsmann Foundation: The European Added Value of EU spending: Can the EU help its member states to save money? Notre Europe: Defence spending in Europe: Can we do better without spending more? WSJ: Can the EU Cooperate on Defence? How do you know if the EU is a good spender of money? The accounts haven’t been audited in a great many years. the EU cant account for the money that has passed through its hands. … and there is good evidence of EU money well spent, http://www.wellspent.eu – getting it right for the environment and people! The EU is a dreadful spender of our money, have you seen the Taj Mahal style projects our money is used to fund? I went to Poland to see how its is being spent there. A fortune is being spread in thick clumps benefiting very few people rather than spreading the sauce around & benefitting the many. They have built a new airport in Gdansk that seemingly has little of no flights during most of the day. Roads are being built that would make countries weep at the specification & cost. I have lived in Ireland for 20 odd years & the money spent on similar projects makes your eyes water. You surely know that by providing wells & irrigation you help African countries to Feed & Educate themselves so they can sustain their own economies. The EU throws money at projects that do none of this, quite the opposite. EU funds are dolled out in conjuncture with states adopting the least best practice for the creation of wealth & sustainability. As every day goes by more & more citizens living in the European Union cannot afford the fuel to get to work or heat their homes. Apparently, it was told that each €uro issued, circulates only 3 TIMES / year versus 8 TIMES when spending is in locally printed currency within the eurozone. Money printing is by nature without bearer name, and without place to be cleared locally as value. Restrict geographically a currency to a tiny place what will happen to the local economy ? What kind of speculation will arise ? My euro given to the EU budget for redistribution is still worth 1 for “leveraging” effect to new beneficiaries in other places ? Although EIB says ” we feed all cats regardless of their financial status as we promote job creation projcets” in fact as usual the feed FAT CATS only. hungry cats that are able to create jobs locally are turned down. And the EU has schizophrenic policies. EU wants job creation but only done by fat cats that are unable to think, act, and involve all their energy like hungry cats would do locally. Fantasms in Brussels decision circles thinking that only officers are able to create value and victory and therefore have the right to a uniform and arms and food, while the soldiers are unfed, without arms and uniforms. THIS ARROGANT attitude of EU authorities and their sterilised EBI-BEI keeps extenting the production of misery in our lands that will decide to combine national and socialism as the solution. Eventually they will have to impose martial law across the continent in an attempt to stop the rioting.